The cradle of Dravidian civilisation and culture, Tamil Nadu with a total area of 1.30 lakh sq km (11 largest state in India) has a population of 7.2 crore as per 2011 census, the sixth largest population among states. Having one of the largest coastlines in the country, Tamil Nadu has 32 districts with varying geographical conditions and is the second most industrialised state in the country. While Erode is the biggest district, Chennai is the smallest and over the years, economic growth has reached the remote corners of the state, thanks to a well-networked road and rail connectivity. While down South, especially in the Cauvery delta, agriculture still plays a significant role in determining the lifestyle of the Tamils, there has been consistent growth in industry and services too thus expanding the job opportunities for the both the urban and rural youth. In a competitive spirit, the government woos foreign investors and corporate to set up operations in the state by offering them a favourable environment and a number of packages including subsidies and incentives. Besides, with a literacy rate of over 80% and steady progress in IMR, MMR and other health indicators, Tamil Nadu has done much in the realm of social development with a strong intervention from the authorities to usher in an ecosystem that looks after the human welfare even as the growth story picks up renewed momentum. 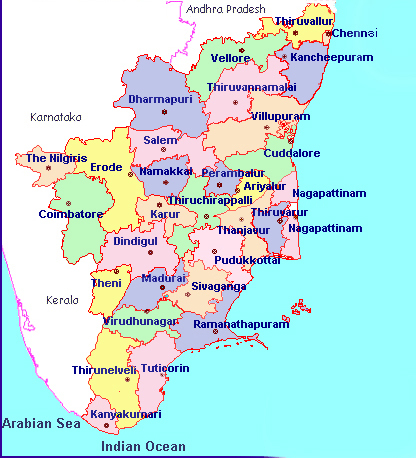 Election Map of Tamil Nadu | For other Maps of India click here.